Sometimes even after you’ve uninstalled a program, its entry will remain listed in the Add or Remove Programs or Programs and Features list under currently installed programs in the Control Panel. This is usually caused by a badly written program that doesn’t properly uninstall itself. The entry is not removed from the registry and therefore remains in the list. If you try to uninstall it again, you’ll most likely just get an error message. Newer versions of Windows will detect this problem and actually ask you if you want to remove the entry, which is nice. However, if you’re still running Windows 7 or Vista or XP, you’ll still run into this problem. Luckily, there is an easy way to manually remove these stuck entries from the list. It requires some registry editing, so be sure to make a backup of your registry first in case you mess something up. 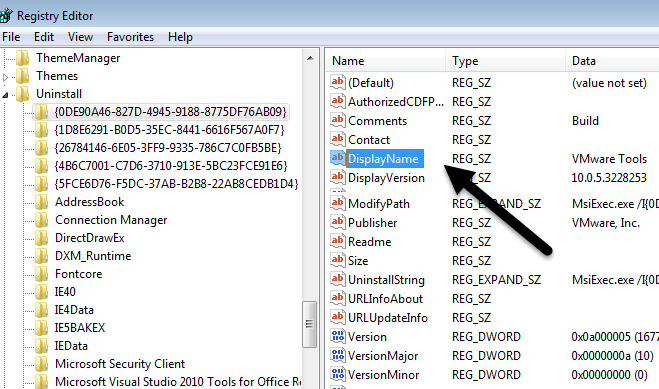 To open the registry, click on Start and type in regedit. Now navigate to the following registry key and expand it. You’ll see quite a few entries listed, some of which have friendly names and some that have a really long identifier. You can easily identify the programs with the long identifier by just clicking on it and looking for DisplayName at the right. In the above example, you can see one of them is for a program called VMware Tools. Find the program that is stuck in your program list and then right-click on it in the left-hand menu and choose Delete. Now you might be wondering why all the programs you have listed under Programs and Features are not showing up under this registry key? The reason is because you might have 32-bit programs installed on a 64-bit version of Windows. Here, for example, you will find all the entries for Java, if you have that installed. You’ll also find a bunch of entries for Microsoft Office, if you have the 32-bit version installed. Again, just right-click on the entry and choose Delete to remove it. You’ll need to restart your computer and then open up the list of programs in Control Panel to see the changes. It should hopefully be gone. If you don’t want to mess around with the registry yourself, Microsoft has a free Fix It tool you can download that specifically deals with this issue of programs that cannot be completely uninstalled. The program will run on Windows XP, Vista, 7 and 8.1. It does not work on Windows 10, but hopefully you should never have this issue on Windows 10. Finally, there is one other way to go about fixing this problem and that is using third-party tools. 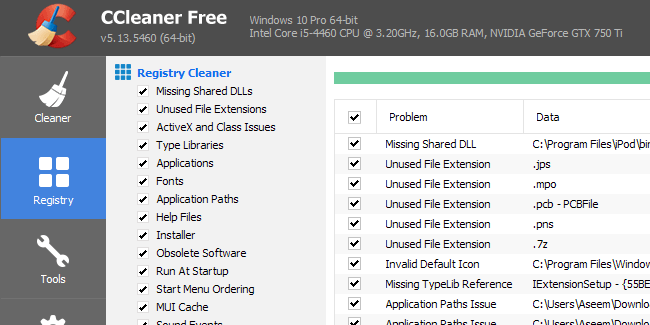 One of my favorite programs for cleaning up the registry is CCleaner because it’s super safe to use. It’s actually the only program I recommend for fixing problems in the Windows registry. Hopefully, using one of the methods above, you will be able to clear out any entries that were refusing to go away! If you have any questions, feel free to comment. Enjoy!